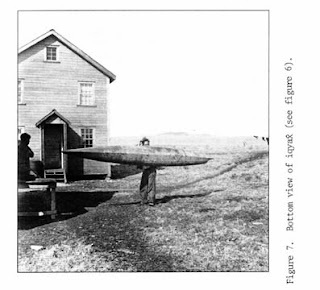 Here are some more Aleut/Unangan boat builder photos. The first one is from a book written by Ethel Ross Oliver. She was a school teacher in Atka and wrote a book about it called Journal of an Aleutian Year. 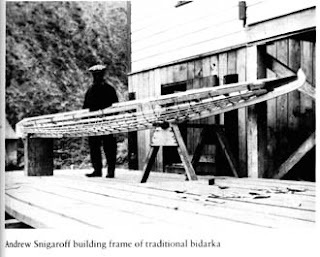 The picture is of Andrew Snigaroff standing in front of a baidarka frame he built. I posted this picture somewhere on my website a few years ago and sometime after got an email from the grandson of Andrew Snigaroff wondering if I knew where that kayak had ended up. I did not know. And I have since lost the email sent by the grandson. I hope to find his email address again so I can find out a little more about Andrew. Apparently he was the last or one of the last baidarka builders on Atka. The baidarka in the Phoebie Hearst Museum in Berkeley is also from Atka and looks very similar to this one, though not exactly the same. It may or may not have been built by Andrew Snigaroff. Based on stylistic differences, I'm inclined to think that it wasn't. But I'm only guessing. 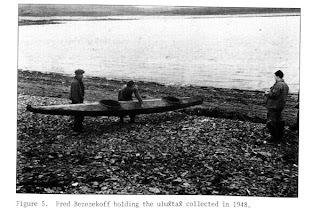 The remaining pictures are all from a book called Contributions to Kayak Studies. The article was written by Eugene Arima and John Heath. The pictures were taken in Nikolski on Umnak Island in the 1930's. 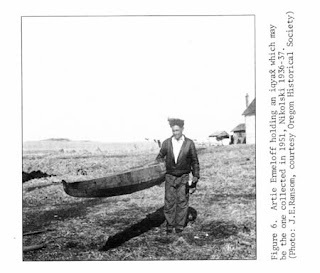 The man holding the single hatch baidarka or Iqyax^ is Artie Ermeloff. 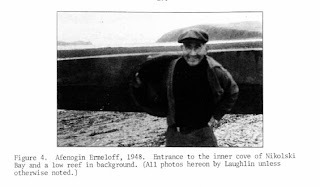 This photo is of Afenogin Ermeloff. And Fred Bezezkoff holding an Ulux^tax^. Bottom view of an iqyax, person holding the boat not identified. I dont' know if any of the men pictures built any of these boats or which ones they built, but it's safe to assume that they all knew how to build baidarkas. Hats off to them all. Angie, thanks for the offer of information. I usually show up in Anchorage once a year for the APIA urban Unangan culture camp. If you can email me directly at wolfgangbrinck dot com / boats I might be able to communicate a little more directly with you.